Another of Herr's traditional pack designs and the bright and bold yellow works very well with the dark red writing. The image in the centre is a little dated, but overall it is an effective older style design. Again, as this is much the same Chip, this is the same write up as the Crisp 'n Tasty review: It says these Chips are Crispy on the packet, and they are. A light, crumbly crunch which can turn a handful into a crackling mouthful of mushy potato pretty quickly. What follows is exactly what we wrote for the Crisp 'n Tasty version: A standard, no frills, basic and simple, Chip. A standard thickness upon which any could be designed. There are some blemishes and natural colors. Little in the way of seasoning, and a pretty large amount of grease. This section of the review is different. 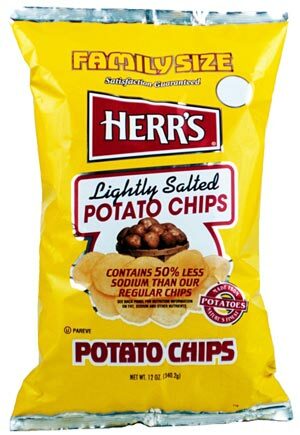 A tasteless and flavorless Chip that may well have 50% less salt, but it also makes it 50% more pointless. If you want a potato taste have a potato, which won't have the saturated fat of these Chips. That is just an opinion of course - some would consider this a great accompaniment to an exciting sandwich or even the base upon which they could put their own seasoning.